As the summer season is in full swing, Sosumi Records stay true to form and ready up another bumper pack of exemplary free dance music to thank its loyal fan base. 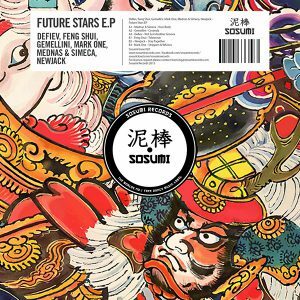 The Future Stars EP is a showcase of some of Sosumi’s hot tipped producers, fresh on the scene. The EP includes long awaited and highly anticipated fan favourites such as ‘Cavenda’, ‘Not Just Another Groove’ and ‘Strippers & Whores’ as well as brand new, fresh from the studio tracks ‘Teletronix’, ‘Stay Together’ and headline record ‘Your Body’ from Mednas & Simeca. Once again each track represents a common denominator with all Sosumi releases, an infectious groove entwined with a prominent high energy output, but this release marks a milestone in Sosumi developing its sound across more and more of the vast house music genre.